Every once in a while, I like to introduce a little bookish chaos into my life, and one fun way to do so is by ordering a Bas Bleu surprise package. So many of the books in their catalog look enjoyable (and are already on my list) that I’m sure to end up with a few things I’m already interested in and, perhaps, a few things I’d never heard of but am willing to try. I ordered myself a box for Christmas 2016, and this book by Ben Montgomery was one of the books inside. I’d never heard of it, or of Grandma Gatewood, but it looked like it might be entertaining enough, so I kept it. And what an enjoyable read it turned out to be! For those as unaware as I was, Emma Gatewood was the first woman to walk the entire Appalachian Trail alone (2,168 miles) in a single season. This was in 1955, when through-hiking was not quite the phenomenon it is now, and Gatewood was 67 years old. She was wearing Keds and carried with her just a denim bag, filled with the most basic supplies. She hadn’t even told her 11 children where she was going, other than that she was going for a walk. Having read about the AT in National Geographic a few years earlier, she thought it would be a good lark for someone like her who loves walking outdoors. It was not an easy trip, partly because the AT was not as well marked or maintained then as it is now. 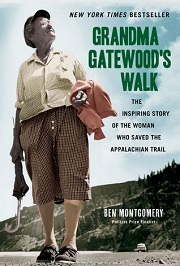 Montgomery subtitled the book “The Inspiring Story of the Woman Who Saved the Appalachian Trail” because of Gatewood’s account of the trail conditions. She was open about how what she found differed from the vision in National Geographic of hikes that anyone of moderate fitness could handle with good shelters about a day’s hike apart. And thanks to her account, as well as the general interest in the trail that her trip generated, the AT was rerouted in some areas and work was done to improve maintenance overall. The trail improvements, however, are not the main focus of the book, which is really about Grandma Gatewood’s first full journey up the trail. Each chapter focuses on a different stretch of the trail and includes maps and dates, so it’s easy to get a sense of where she is on the walk from Georgia to Maine. Throughout the narrative, Montgomery also intersperses information about Gatewood’s past and the abusive marriage she’d managed to break free from, as well as context about the history of the trail and other events that are relevant to the story. Some of these asides felt a little too tangential, but most of the time, the historical context fits in well. I’m not a hiker, although I’ve been on short hikes on the Virginia sections of the AT, but I still found Emma Gatewood’s story fascinating. I devoured the book in a single day and had a lot of fun doing so. 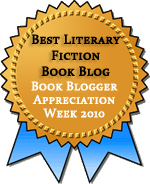 This entry was posted in Biography, Nonfiction, Travel/ Exploration. Bookmark the permalink. What a nice surprise in your surprise box. I absolutely love books about pilgrimages–from A Walk in the Woods to Wild to Unlikely Pilgrimage of Harold Fry, and many others–so this is definitely going on my reading list. Grandma Gatewood sounds inspirational and practical, and I like that the history of the trail and region it goes through are included. I would love to hike at least part of the AT someday. I used to live in a part of Virginia very close to the AT, and I went on short day hikes once in a while and enjoyed it. I can’t imagine hiking the whole thing! What a cool way to shake up your reading! I too am not a hiker, nor indeed any kind of outdoorsy person, and I definitely wouldn’t have picked this up on my own. But it sounds terrific. It’s so great, because she’s so great.